Termirepel (TM) – To keep ants at a bay! You see that black trail and following it you reach your kitchen. Then you reach to the rack placed with sugar container and the container seems to be filled less of sugar but more of these pesky creatures! You know well which creatures I am talking about! Yes, those are the ants! Ants usually live in wood or soil outside our house, and only march into our house to gather food. On the other hand, ants may live inside our house as well. Ants love sugar! They’re attracted to sweet substances but are an omnivorous insect, which means they’ll eat any type of edible substance they can find. They also need water to survive. They enter different structures in order to scavenge for food. There are many species of nuisance ants that invade our homes – they come in all different sizes and colors. 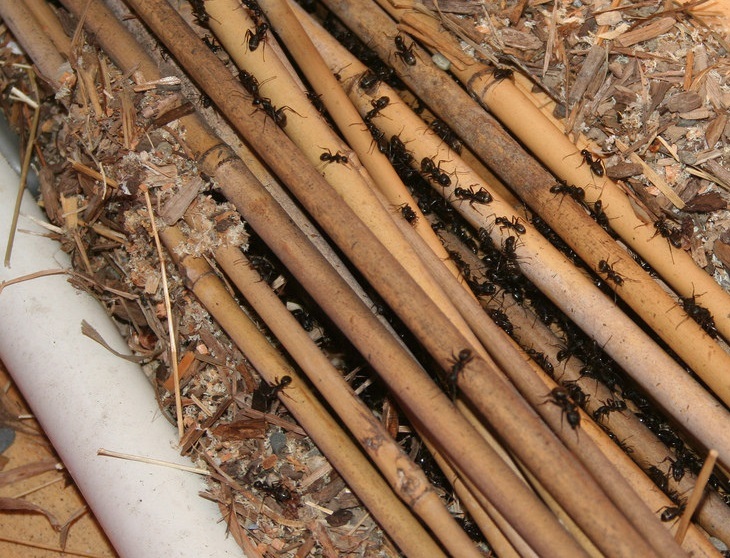 Carpenter ant infestations often go unnoticed until it is a costly situation to correct. The damage caused by carpenter ants is distinct although it is often confused with termite damage. While termites feed on the cellulose found in the wood, carpenter ants excavate galleries or tunnels in decaying wood. Contrary to popular belief, carpenter ants do not actually eat the wood. Rather, they hollow it out to nest inside, which may result in structural damage. Rotted wood in window frames and similar spots provides an ideal home for acrobat ants and other ant species. Tiny grease ants may seem to appear out of nowhere and sneak into food containers. 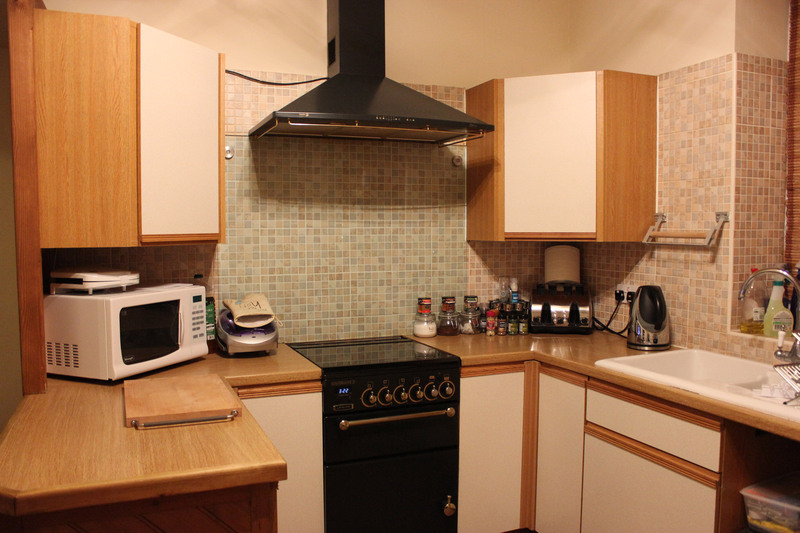 Rather, they are appearing out of tiny gaps and cavities in the kitchen, including spaces behind kitchen cabinets. Such nests can be difficult to find. When one ant finds food or water they will lay down a chemical trail that guides other worker ants to the source – you will see trails of ants going back and forth from the food or water. These creatures seem too small but the menace they cause is huge! Just in time for the winter season, a new group of visitors has descended on South Florida. But they’re not friendly tourists. An invasive species of yellow ants (Plagiolepis alluaudi) has arrived in the Riverland neighborhood of Fort Lauderdale, researchers at the University of Florida have discovered. 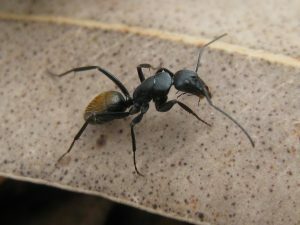 These types of ants, natives of Madagascar, have never been seen outside of Hawaii in the United States, according to the experts. “By the time you detect them, the colonies are so big and spread out that they are hard to control,” said Thomas Chouvenc, UF assistant professor of urban entomology based at the Fort Lauderdale Research and Education Center. They’re also difficult to get rid of. Two bites of a muesli bar was all it took for Deanne Cook to feel like she was on fire. The Karratha resident quickly realized it was not just the snack she was eating but dozens of tiny ants. “It was like I was on fire. I was in the shower sobbing,” she said. “I didn’t even knowing what had happened until I went back to the pantry and saw the carnage. A colony of ants had attacked her food, in some cases chewing through sealed packets. The most common tool used to manage ants are the insecticides. The ants have got immune to the traditionally used insecticides. However, besides being extremely toxic and harmful to the environment, most insecticides used for ant control will destroy beneficial insects. Also, usage of such harmful insecticides in a home can be dangerous not only to the ants but also to our kids and pets! Now, we no longer should depend on these conventional, toxic insecticides to deal with these pests! To deal with the menace caused by these ants we have come up with eco-friendly and non-hazardous methods! C Tech Corporation offers a range of non-toxic, non-hazardous anti-insect aversive, which can be successfully used to keep pesky ants at bay. Termirepel™ can be easily described as insect aversive, used also against all types of insects and which works on the mechanism of repellency. It means that it does not kill the target insects but only repel them, thus balancing the ecology and helping in maintaining the goal of sustainability. There are more than 500 species of insects against which this product works. The products temporarily inhibit the mating cycle of the insects. It temporarily impairs the ability of insects to reproduce, i.e. the female will not lay eggs. The product triggers an unpleasant reaction within any insect which might try to feed on the application, ensuring that it is kept away from feeding on the treated area. It temporarily blocks the reproduction system of the insects by hindering the release of the vital hormones for growth. This product can be easily used against ants and many other insects. The product can be used in the form of a masterbatch which can be incorporated with various polymeric applications while they are manufactured. This will prevent the ants from feeding on such applications. The polymeric cables and wires, pipes and other household applications can be incorporated with our products to keep ants away. The product in the form of liquid concentrate can be mixed with paints in a specific ration and applied on the walls, instruments, equipment etc. It can be used in terms of lacquer as a form that can be coated on the wooden, polymeric, metal and a variety of end applications. The lacquer can be applied to the fence, wooden objects, furniture, ceilings etc. to keep ants away from homes, buildings and other public places. The kitchen cabinets can be coated using our lacquer to prevent ants from entering the stored goods. Write us at technical.marketing@ctechcorporation.com if you are facing nuisance caused by the pests!